It’s Sunday night and, thanks to the Berks Jazz Fest, the Cheers American Bistro at the Doubletree Hotel in Reading is hopping. Men in their favorite band T-shirts and tie-dye-clad ladies line up three deep along the bar waiting for service. The bartenders and waiters hustle to ensure glasses are full, food is served hot and all patrons are out the door before the band hits the stage. On the way to the ballroom, guests stop by the festival’s merch table. The line for cold beverages snakes down the hall. Other vendors sell their wares nearby. 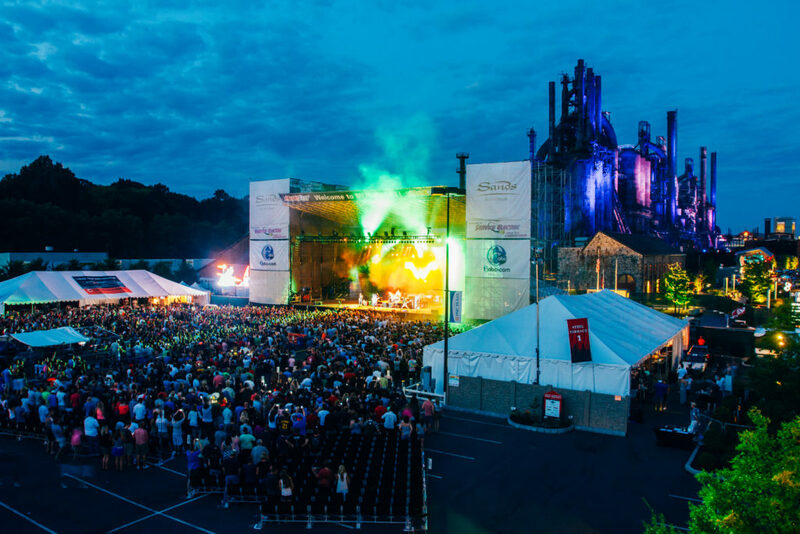 Festivals like this are big business in Pennsylvania and sweet music to the ears of economic development officials. In 2016, the nonprofit Americans for the Arts conducted a survey of 250 arts organizations across the United States, including those in Berks County. The Arts and Economic Prosperity 5 report indicated that arts programs in Berks generated $18.9 million in economic activity in 2015. A total of $10.8 million was spent by 20 arts organizations and another $8.1 million by audiences, supporting 625 full-time jobs, delivering $11.6 million to household incomes, and producing $1.9 million in local and state tax revenue. Meanwhile in the PA Wilds, the 17-day Endless Mountain Music Festival, held in and around Tioga County, is an important cog in the economic development engine of a region that relies heavily on tourism dollars. According to Executive Director Cynthia Long, the festival generated nearly $441,000 plus approximately $39,000 in local and state taxes in 2018. Over the course of two consecutive weekends in mid-July, Camp Bisco (July 18 – 20, 2019) and the Peach Music Festival (July 25 – 28, 2019) will be held at Montage Mountain near Scranton in Lackawanna County. Both festivals cater to a different corner of the vibrant jam band community — the former is an annual jam/EDM event headlined and organized by Philly trance-fusion band The Disco Biscuits; the later will be headlined by Phil Lesh, Trey Anastasio and The String Cheese Incident — and together they are a boon for the local economy. 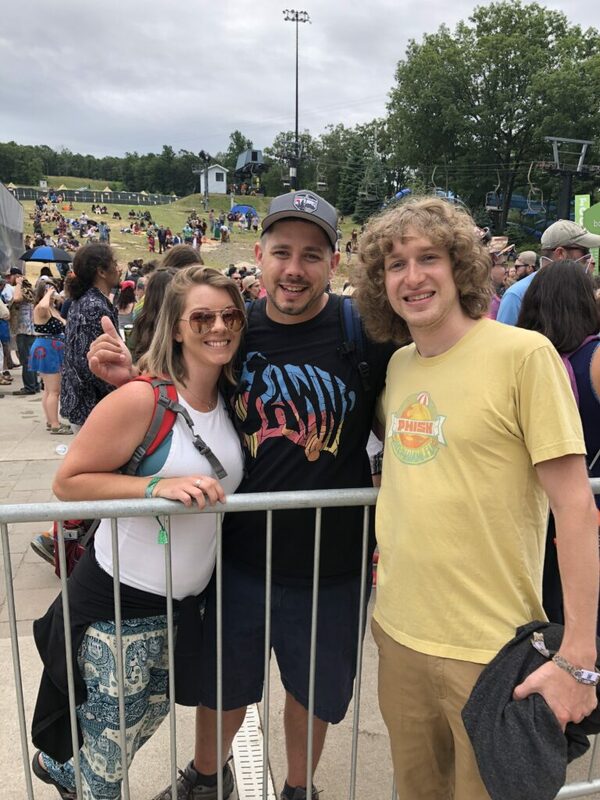 Jeremy Schon, right, of Pigeons Playing Ping Pong poses with fans Jenny Remetta and Frantony Rocco at the 2018 Peach Music Festival. In published reports, festival owners Live Nation estimated that, in 2018, Camp Bisco and the Peach Music Festival drew attendees from all 50 states and had a $24 million impact on the region. Festivalgoers who don’t camp at the events will stay at area hotels, dine at local restaurants and shop at nearby businesses. Meanwhile, on the western side of the state, Pittsburgh organizers are proving that free festivals can also be big business. Billed as one of the largest free arts festivals in the world, the 10-day Three Rivers Arts Festival welcomes 500,000 attendees. According to a survey of 1,200 guests, they spend an estimated $21.5 million annually in lodging and dining alone. There are many reasons music lovers are willing to spend their hard-earned money at festivals. Some cite the sense of family that prevails while others enjoy the different styles of music presented over a long weekend. Jenny Remetta of Attica, New York, says she attends about three festivals per year and plans to hit both Camp Bisco and The Peach in 2019. 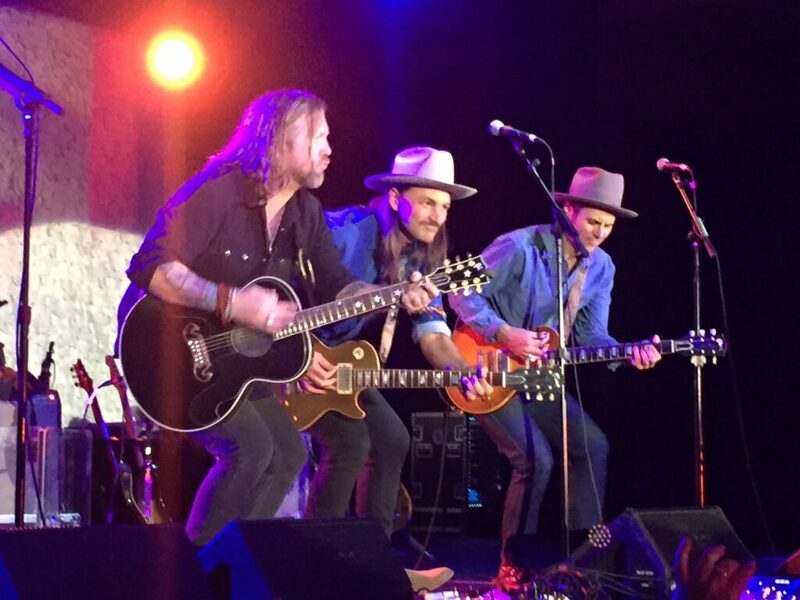 The Allman Betts Band performs at Berks Jazz Fest. The band will hit several PA events this summer, including The Peach Music Festival. 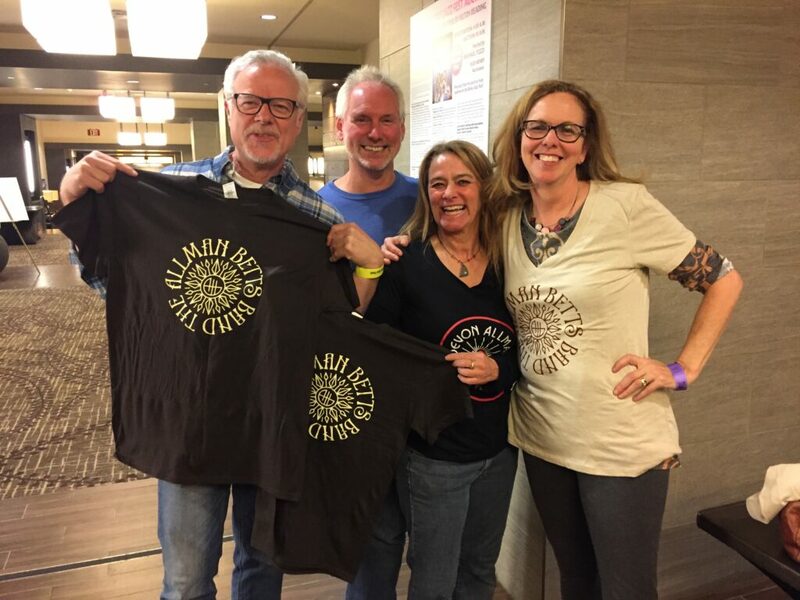 Sue Kane, an Albright College alum, appreciates the intimacy of small festivals like the In and Out of the Garden We Go Festival (June 7 – 8, 2019) in Bucks County but also the communal vibe at larger festivals like The Peach, which she attended for the first time in 2018. This year, Kane and a crew of college friends returned to Reading to see the Allman Betts Band at Berks Jazz Fest. Laura Curren, another Berks Jazz Festival attendee, was turned on to music festivals by her husband Paul, who has the signatures of many members of the Grateful Dead tattooed on his right arm. In addition to the music, Curren enjoys the street commerce that occurs at festivals. Music festivals also provide a nice return on investment for the artists who play them. Just ask Berry Oakley, Jr., a bass player in the Allman Betts band whose father was a founding member of legendary Southern rockers The Allman Brothers Band (who actually created The Peach Music Festival). Here are some Pennsylvania-based music festivals worthy of your dollars in 2019. Genre: Various musical styles, including blues, gospel and jazz. Cost: Some events are free while others require a ticket. The 10-day Jazz Fest features a variety of talent and genres with concerts at venues large and small encompassing contemporary jazz, traditional jazz, pop, crossover, blues, funk, R&B, gospel and unique concerts produced especially for the festival. Featured artists include Boney James, Arturo Sandoval and, West Coast Jam! with special guest musicians Richard Elliot, Rick Braun, and Peter White. Genres: Various musical styles, including country, pop and rock. An iconic celebration of the arts in Pittsburgh, it is also one of the largest and most-celebrated FREE arts festivals in the world featuring 10 days of music, theater, dance, public art installations, gallery exhibitions, a visual arts market, creative activities, food and much more. Featured artists include India.Arie, Mandolin Orange and Karl Denson’s Tiny Universe. Cost: Various pricing levels and packages available. Now in its 17th year, Camp Bisco is an outdoor music festival held at the picturesque Montage Mountain Resort, a world-class concert venue and waterpark. The event features three days and nights of music on three stages, and provides on-site camping for its guests. Featured artists include The Disco Biscuits, Umphrey’s McGee and Bassnectar. Founded in 2012 by the Georgia-based Allman Brothers Band — they played Montage Mountain numerous times in the nearly five decades they toured — the Peach Music Festival proves that the “road goes on forever.” Although the Allman Bros ended their musical journey in 2014, their festival lives on, paying tribute to their legacy and the many bands they’ve inspired over the years. Featured artists include Phil Lesh & Friends, Trey Anastasio Band and The String Cheese Incident. Where: Various venues throughout Tioga County and New York state. Genres: A mix of musical styles, including blues, Broadway and classical. Cost: Some events are free while others require tickets for admission. The mission of the Endless Mountain Music Festival is to bring world-renowned musicians to the communities of northern Pennsylvania and southern New York, enriching the cultural, economic and educational life of the Twin Tiers region. Featured artists include blues guitarist Abbie Gardner, guitarist Vance Gilbert and Kansas City musicians Bram Wijnands and his daughter, jazz singer Lucy Wijnands. Lead image courtesy of Three Rivers Arts Festival. JAMES MENTZER is president of Mentzer Communications and a freelance writer whose first book, Pennsylvania Manufacturing: Alive and Well, was published in 2017. He resides in Harrisburg.